Note to pre-published writer friends: When you do get an agent and sell your book, be sure to join an online community for debut authors. I’m in the Fearless Fifteeners and the Class of 2k15. Not only are these groups a great source of support, but you will get to read Advanced Reader Copies! ARCs are the uncorrected proofs that are sent to reviewers, librarians, and book bloggers to promote the book. This starts at least six months before the final, corrected, hardcover is officially released. My fellow fifteeners and 2k15 classmates are starting to receive their ARCs and are sending them on ARC tours to the rest of us. We read, write notes in the book, and then send it to the next person. Very cool. I’ve decided to let you all know about the ARCs I’m reading, which is the least I can do to help my 2015 debut colleagues. These are introductions, not reviews, just to let you know what’s coming out in the next year. 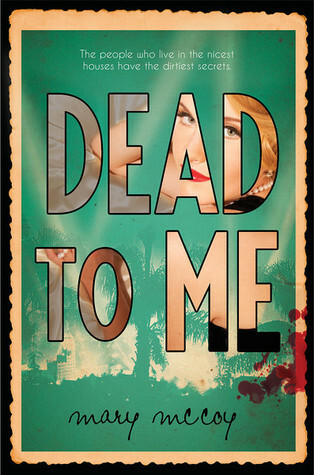 First up is Dead to Me by Mary McCoy (Marc 3, 2015/Disney-Hyperion). Here’s the description: LA Confidential for the YA audience. This alluring noir YA mystery with a Golden Age Hollywood backdrop will keep you guessing until the last page. What I liked about it: This isn’t a mystery about who the bad guy is. He’s openly bad. (Note: the *psychopathic* movie star in the description.) Mary keeps you guessing about the other characters’ actions and motives. People are not who they seem throughout the novel. Mary’s love for and knowledge of Los Angeles are also obvious, as the city and time period are brought to life in her descriptions. About the author: Mary McCoy is a writer and librarian in Los Angeles. You can find more of Mary’s writing about Los Angeles’s notorious past at the 1947project and On Bunker Hill. She is also a contributor to Sleuths, Spies, & Alibis, and you can find her on Goodreads and Twitter.